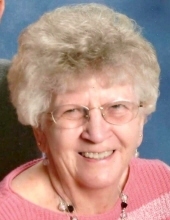 Carolyn Yvonne King Ferriell, 83, passed away Thursday, March 28, 2019, at Harrison Springs Health Campus in Corydon, Indiana . She was born January 5, 1936 in Stampers Creek, Orange County, Indiana to Raymond and Estella Holmes Riester. She was preceded in death by her parents, and sisters: Evelyn Freed and Margie Taggart. She is survived by her husband Joseph A. Ferriell of Corydon, sons, Ricky King (Mary Jo) of Paoli, IN; Allan King (Stacey) of Douglasville, GA; Doug Ferriell (Donna) of Boonville, IN; Darin Ferriell (Stephanie) of Marengo, IN; daughters, Deborah Gentry (Jeff) of Indianapolis, IN, Dawn Lewis (Troy) of Elizabeth, IN , 15 Grandchildren and 9 Great-Grandchildren. Funeral Service will be Monday at 11:00 AM at St. Joseph Catholic Church in Corydon, Indiana. Visitation will begin Sunday at 4:00 PM until 8:00 PM with a prayer service at 7:00 PM at Gehlbach & Royse Funeral Home in Corydon, IN. Burial will be in Most Precious Blood Catholic Cemetery in New Middletown, Indiana. The family request memorial donations be made to Saint Joseph School in Corydon, Indiana. To send flowers or a remembrance gift to the family of Carolyn King Ferriell, please visit our Tribute Store. "Email Address" would like to share the life celebration of Carolyn King Ferriell. Click on the "link" to go to share a favorite memory or leave a condolence message for the family.